See you all again next year for #GMM19! The wait is over, Within Temptation is the first headliner for #GMM19! On Friday 21 June the Dutch metal band will present their new record ‘Resist’ and their other hits to the GMM crowd! Slipknot will be headlining on Saturday 22 June. 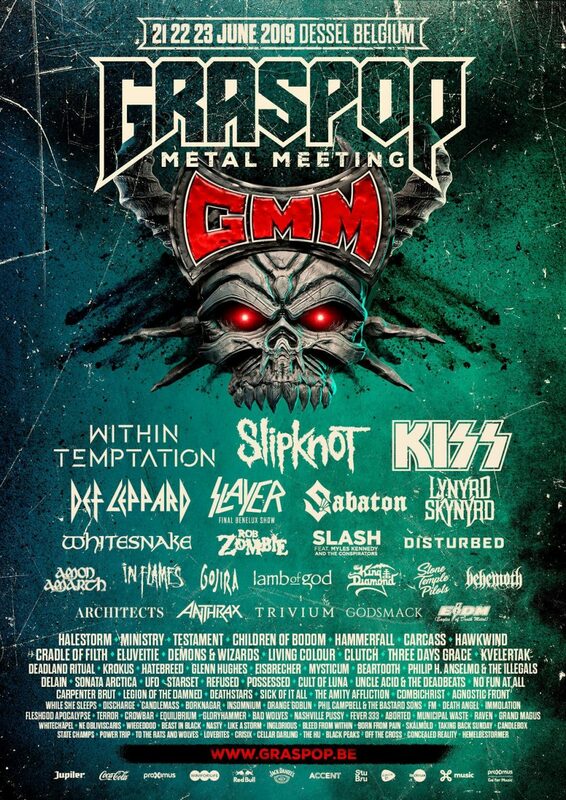 Tickets for Graspop Metal Meeting 2019 go on sale Saturday 27 October at 10 am! More bands to follow soon! On Sunday 23 June KISS is bringing their End Of The Road World Tour to #GMM19, to say farewell to their Belgian audience! Get ready for the biggest Kiss show yet! Also added to the bill: Slash feat. Myles Kennedy and The Conspirators, Lamb of God, Anthrax, Cradle of Filth, Death Angel and Skálmöld, Def Leppard, Slash, Lamb Of God, Anthrax, Sabaton, Lynyrd Skynyrd, Whitesnake, Disturbed, Amon Amarth, In Flames, King Diamond, Beartooth, Architects, Carpenter Brut, Atreyu, Candlebox, Behemoth, Clutch, Beast In Black, Gojira, Kvelertak, Deadland Ritual, While She Sleeps & Insomnium. GMM’s 24th edition from Friday, 21 June to Sunday, 23 June 2019 in the Festival Park in Dessel promises to be exceptional. The addition of horror master and hellbilly Rob Zombie, ’90s grunge icons Stone Temple Pilots with their new singer Jeff Gutt, newcomers to Dessel Eagles Of Death Metal, the Belgian black metal trio Wiegedood and 19 other bands means that the line-up is 75% complete. More names will follow in the new year.